Paddle Round The Pier is an annual beach festival that attracts over 50,000 people to Brighton Beach over a weekend in July. We are big supporters of the charitable festivities and are official media partners for this year’s event, which is on 4th and 5th July 2015. 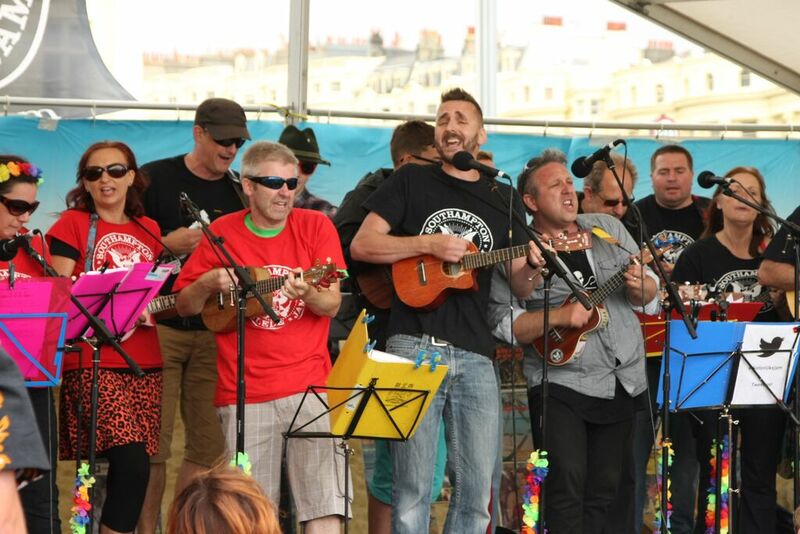 We caught up with the festival’s organiser David Samuel on how on earth a group of volunteers have taken this event from extremely humble beginnings to where it is now, whether Brighton is a SUP or Surf town and how much a beer is at the festival. So David, we’ve been coming to PRTP for several years now and seen it grow into this awesome weekend packed full of happy people with lots going on. Tell us where this thing has come from? Paddle began as a campaign to raise awareness for SAS and to create a social gathering for surfers in the area. We had just 70 people attend in 1996 but this figure soon doubled by year two. By year three we introduced a second charity the RNLI. It was recognised that the event was a great vehicle to raise funds for charity and that should be its core objective going forwards. Humble beginnings man, where do you think the festival is now? In 2013 we had 55,000 people attend as Paddle Round The Pier has become the worlds biggest charity beach and Watersports festival. The actual “Paddle” has become an umbrella event for over 30 other Watersports events which are big in their own right. It’s morphed into a celebration of all paddle and wind sports – supported by a massive Paddle Village of beach lifestyle retail and exhibitions. That’s a lot of people and a great opportunity for brands to target potential customers, but without focusing too much on selling stalls, where do you see the event going? “Paddle” as it affectionately known, will continue to host new events over the weekend. In 2015 for the first time we are hosting the Paddle Lecture Theatre with 30 minute mini-lectures on subjects as diverse as Board dynamics, sail repairs, Oceanography, Coastal engineering, bathymetry, the history of the Sea Shanty – you name it, there’s something there for everyone. Cool, definitely sounds different. So “Paddle” is a volunteer thing, what keeps you motivated to run the event? We have a team of 45 people in the Paddle crew who regularly give up a week’s holiday each year to work on the event. After 5 years service they become “Ohana” and get to wear a patch – which has become a very sought-after thing! Seeing the difference the event makes is what drives us. It’s no longer just about raising the cash for the charities involved but also about sharing our love of the sea and all things connected. We run a Schools Surf Life Saving program for 850 kids leading up to the event for four weeks, and the Access Beach at Paddle sees disabled kids and young people have equal access to the sea – often for the first time in their lives. It’s about sharing the stoke. I defy anyone to see the look of joy on these kids faces and not want to get involved. We come back year after year as do thousands of others, but who’s is the festival aimed at and what do you think makes people come? 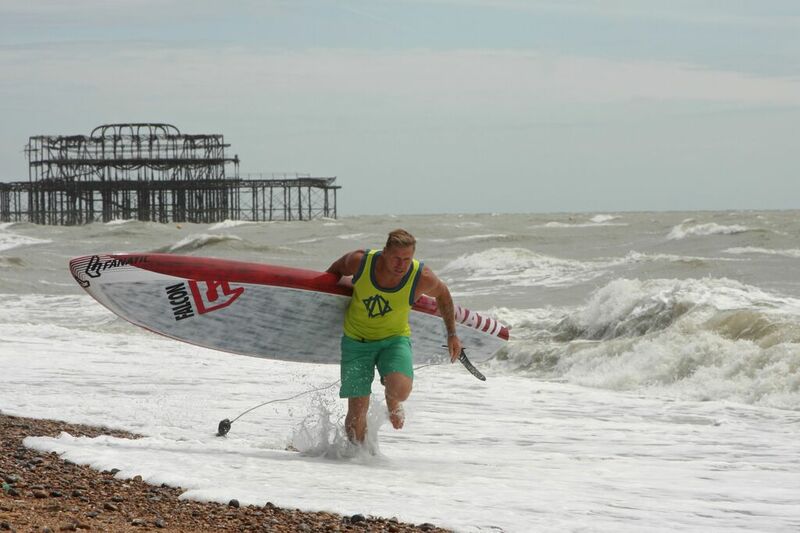 Paddle Round The Pier is simply aimed at anyone that loves the sea and a beach lifestyle. It works because there is so much to do- whatever you are into. So even if you partner is not interested in getting wet; they can still go off and enjoy one of the many music stages or restaurants/bars and watch some of the land based extreme sport shows. And I haven’t even mentioned the shopping yet in the Paddle Village! I know it’s not a music festival, but there’s always some great local talent performing over the weekend, what have you got in store? Paddle is known for supporting the top up-coming acts. It’s an eclectic mix and one which is a tough job to decide who gets to play. From January through to May we average 75 bands per week applying to play. So the very best is always on offer. Cool. So the big question, how much is a beer at the bar? Always Pub and never festival prices which is why people come back year on year! It has appeared that the surf side of things has gotten smaller and SUP’ing is massive. Is this a trend that’s happening in Brighton on the whole? Less surfers more SUP’ers? I think that as the south coast mainly gets it best surf in the winter based around storm fronts that many people now also own a SUP for summer fitness. It’s taken over the sit-on-top kayak market as it’s become so accessible and Paddle naturally is keen to celebrate that fact. I want Paddle to celebrate all things water sport related as I personally will do as many as possible dependant on the conditions, so flat days are SUP or wakeboarding, wind and I Kitesurf, groundswell and I dust off my thruster. Never limit yourself and you will always smile. Nicely put. What’s going on for the classic thruster surfers this year? Well the obvious one to mention is the longboard paddle race – a simple idea in association with Errant Surf Holidays where people can win a surfing holiday for two! Then there is the talk by James Otter on how he builds his legendary wooden surfboards, with a packed programme across the two day event, there’s a lot to do and see. What do you prefer, SUP or surf? I like to challenge myself with something new each year; I’ve been on a SUP since around 2006 but have always ridden the board which suited the conditions. My Robert August short board (which Mr A personally shaped for me a few years ago) is no-good on 1’ slop so I’ll grab a SUP then or if it’s cleaner then maybe my longboard. Right now I’m learning to knee surf a rescue board, carving turns off the top and maintaining control on one of these isn’t as easy as it looks on a decent sized wave! In the past I have forced myself to just body surf for 6 months to see how I could improve. Surfing for me is all about self improvement, competing with yourself and not others. Maintaining your own stoke is about sharing that feeling with others. Keeping the aloha spirit alive. Great ethos David, I’ve always wondered how the deep South crew stay motivated and now I know. See you in a few weeks! 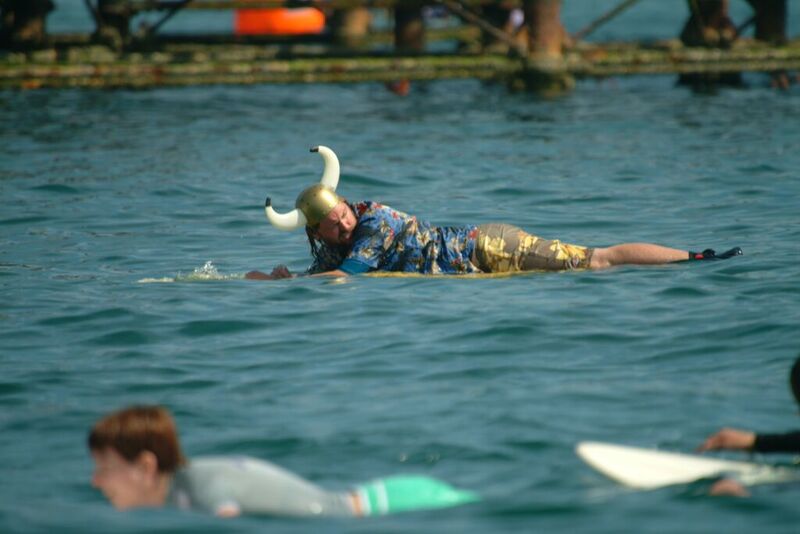 More info on Paddle Round The Pier can be found here.